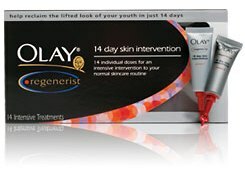 Last night, my friend spotted a pack of Olay Regenerist 14 Day Skin Intervention on my dresser. Only one of the 14 packets were removed, so she asked if I was using it. “No,” I replied, “I just thought I’d try it, because some of my co-worker working on the Olay account at Saatchi thought it was great.” Unfortunately, I’m not so good with regimines. Crest White Strips proved that to me! After 5 days, I was forgetting to put on the strips! So, the rest of my 10-day pack was useless! From my experience working on the Olay team, I could tell her immediately that the two people who recommended the 14 Day system to me in the first place were both in their lower 20s. But I did some more research to solidify my answer. Note of Caution: If you are using anti-wrinkle creams, make sure you drink enough water, as most creams cause dehydration and could actually aid in creating wrinkles if not used properly. Personally, I’ve been trying to move towards using all-natural body care treatments. But it’s just so difficult and expensive to completely switch over everything: skin care, body wash, shampoo, conditioner, make-up, deodorant, lip balm! So, I’m going to keep switching one product at a time, as the old stuff runs out. In the meantime, at least we know that using anti-wrinkle creams in our 20s is okay. The tips you given in the last lines (notes of caution) are helpful. I will take care of this. Hi there may I quote some of the material found in this entry if I provide a link back to your site? Yes, certainly! Quote away, and a link is always appreciated! Thank you for the compliment on my site design! It’s a simple WordPress template that I really enjoy! It’s by Chris Pearson: http://www.pearsonified.com/.